The sporadic New Orleans related posts continue today through Fat Tuesday. See archives for past NOLA features. Gris Gris is wholly steeped in New Orleans voodoo. It’s all candles, black magic and psychedelic swamp blues led by Dr. John under his late sixties/early seventies guise known as “The Nighttripper.” Genres converge and blend into a bouillabaisse of sounds ranging from jump blues, folk, r&b and traditional African and middle eastern rhythms, all while the doctor is flanked by a group of back up singers adding texture and call and response vocals. A psychedelic landmark, this is a true album experience from beginning to end. 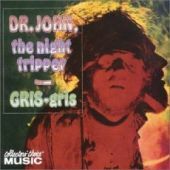 Savvy listeners will notice both Gris Gris and the early Beefheart albums can be heard in much of the psych vein of contemporary indie rock. Elsewhere: Check out this 1970 television spot of Dr. John and his ju-ju minions performing in a recording studio. Freak! The current psych/folk/weirdo set have nothing on this guy. + Dr. John available through eMusic’s 25 Free MP3 trial offer. + Visit The Hype Machine for additional Dr. John MP3s. nice! i love “mama roux” too. it’s a great link track for mix CDs.